In other words, NAMA is conveniently playing the state card again. Eurostat decided that NAMA was not an arm of government in 2009 and that consequently, the €30bn of state-guaranteed bonds issued by NAMA to buy loans from the banks would not come onto the national debt. NAMA has redeemed €3.25bn of its senior bonds today but the extant €27bn would represent 17% of the nominal 2011 GDP of €158.993bn. NAMA competes with other organisations in this State – Certus might be regarded as its main competitor but Ulster Bank and ACC Bank and the rump of Bank of Scotland are also private sector competitors trying to flog loans and properties which are legacies of the property boom in the mid 2000s. Certus won’t be able to claim an exemption on rates on its St Stephen’s Green headquarters which really places NAMA at a competitive advantage to private sector organisations – no wonder NAMA can offer staple finance at such competitive rates! There are about 220 NAMA staff working from Treasury Buildings, the Agency spent €800,000 on “lease improvements” in 2011 and the annual rent is approximately €1m. 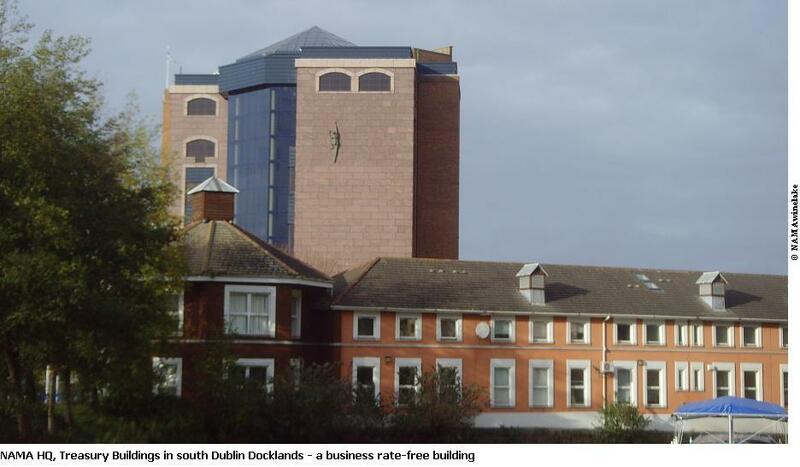 It is understood that Dublin City Council had previously proposed that NAMA should pay rates but NAMA appealed that “proposal” to the Valuations Tribunal and the Commissioner of Valuation has indicated that it will not be defending that appeal and it accepts that the Agency should be entered as List Not Rateable pursuant to Section 15(3) of the Valuation Act 2001. So Minister for Finance Michael Noonan claims he is powerless to change what he calls “historic” agreements on bank salaries, pensions and perks. This, in the wake of the revulsion and anger following the revelation last Wednesday and Thursday at the Oireachtas finance committee that former employees at AIB and Bank of Ireland were being paid annual pensions of €529-650,000 per annum in institutions that were bailed out to the combined tune of €25bn. The furore has blown up now because the significance of the €1.1bn partial top-up in August 2012 of the €1.5bn pension deficit at AIB has been realised more fully, and people are asking where this hole was identified in the Central Bank stress tests in March 2011 and whether Minister Noonan approved of, or even knew about, the transaction. Remember also that AIB employees were offered redundancy packages understood to be “four weeks’ of pay per year of service, including statutory entitlement, or three weeks’ pay per year of service plus statutory entitlement, subject to a payment cap of two years’ annual salary” [Statutory redundancy is two weeks’ pay for every year of service over the age of 16 and one further week’s pay eg work for five years and you get 5*2+1 weeks redundancy. The amount of statutory redundancy is subject to a maximum earnings limit of €600 per week (€31,200 per year)] This at a bank that is 99.8% owned by the State after a bailout of €20.7bn. Remember the 23 workers at Vita Cortex who ended a five-month 161-day sit-in in May at their plant in Cork? Their demand was 2.9 weeks for each year of service. Vita Cortex was not bailed out by the taxpayer. Remember also the referendum last October 2011 to reduce the salaries of judges in this country, salaries which it was felt were copper-fastened in the Constitution and couldn’t be reduced? The referendum was passed with 1,383,877 (79.7%) citizens voting for the amendment and only 354,154 (20.3%) voting against. 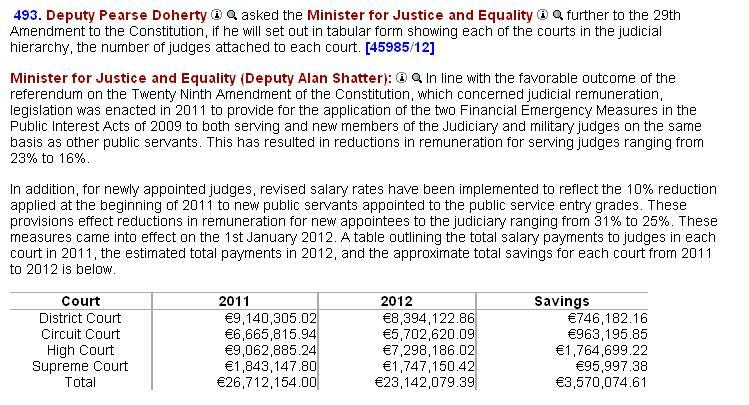 On 23rd October 2012 in the Dail, the Sinn Fein finance spokesperson asked* the Minister for Justice, Equality and Defence Alan Shatter how much was saved annually as a result of the referendum and the response was €3.6m overall though that includes savings for reductions in salary offered to newly appointed judges. So, there are questions remaining for Minister Noonan and the Department of Finance with respect to their oversight of AIB, a bank in which Minister Noonan owns 99.8% of the shares. But it is also patently untrue that “historic” contracts can’t be altered – we did it simply and without great effort in October 2011 when we overwhelmingly voted for reductions in judges’ pay. Bankers have not adjusted to the new reality in Ireland – what is needed is bread-and-butter banking services which do not require Masters of the Universe to deliver, and in the bank jobs marker, supply exceeds demand. And being an employee at a bank does not confer greater entitlements than being an employee at Vita Cortex – in fact because Vita Cortex didn’t get a bailout, arguably the entitlements of bank workers are less than those at companies like Vita Cortex. On Saturday next we get to vote on the amendment to the Constitution upholding rights of children. Substitute “ATMs” for “children” and “banks” for “parents” to the referendum wording and you get the text shown at the top of this blogpost. 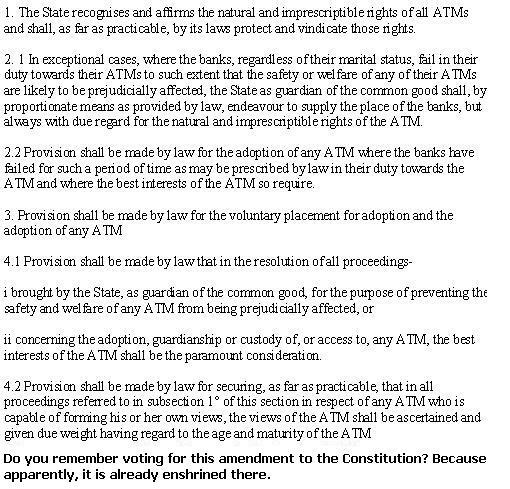 Except in our Republic, we are acting as if we have already passed the ATM referendum though none of you voted for it – what does that say about our priorities as a nation?